There’s something special about films without any narration or dialogue; it’s like imagery and soundtrack bear a subjective meaning, guided in a very gentle, liberal and profound way that’s perceived as intuitive knowledge. That’s why I’ve always been fond of such video installations and the main reason why I chose Samsara (2011) as the cultural object of my master thesis in comparative cultural analysis. 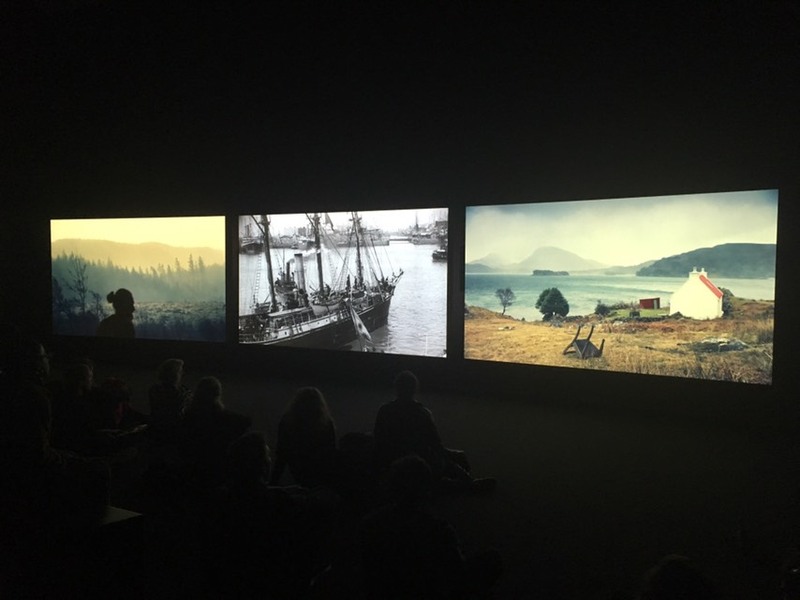 When I went to the opening of John Akomfrah’s Vertigo Sea at the Talbot Rice Gallery, I was stunned by the three-screen film in the White Gallery of the art space that was filled with people watching mesmerised as one magnificent frame appeared next and after the other. The sea was a predominant element as the artist was touching upon issues of ecology and natural disaster, migration and human exploitation; birds migrating and people fleeing as refugees, whale slaughter and people being shot in the streets, people dancing, people drowning, animals hunting and being hunted, everything almost still yet moving in various timescapes. Majestic seascapes were followed by graphic bear skinning and footage of black man in their slavery uniforms, men and animals in spasm; there were times I had to look away. The dominated/supremacist binary was very obvious and the constant sense of displacement was disturbing to watch. With footage coming from the past and the present in a non-linear manner, it looked as if the sea, bearing history itself, was exposing the problematic encounter with Otherness; the otherness of nature, the otherness of other civilizations, the inner otherness of a guilty past exposed through an introspective present. Clocks appeared every now and then in surrealistic context as a reminder of the intertemporality of behavioral patterns of power and abuse, unraveling a multilateral vision of plurality in both tragedy and hope; migration and ecological crises, both the result of many years of institutionalised suffering, are more than someone else’s ordeal; they are incorporated within a more comprehensive malfunction that seems to influence everything and everyone. And such perspective is hopeful due to the fact that by triggering a renegotiation of one’s subjectivity and the Self/Other boundary in a mοre inclusive way, it can indeed have a collective outcome insofar as it proves the feasibility of such endeavor. As a matter of fact and ironically enough, the distinction between the Self and the Other is both real and deceptive. It is real as an ontological truth; people do experience their relation to the Other as a segregation force. They identify with a Self whose heterogeneousness is completely opaque to them and they seem to be ignorant about the interrelation with each other and everything else on the planet. This is why at the same time – and for the foremost – it’s deceptive as well. Even though the Other is estranged from the Self, the former is integral for the cognition of the latter. Everything and everyone that people tend to objectify is the outcome of an illusory, outdated polarisation that requires revision and there are very few moments that people come across artwork that reminds them of that. To me, watching Vertigo Sea was one of these moments. It made me think that we are indeed as species, move in a spiral manner; we progress, we evolve yet we still make the same mistake; we defy the Other, by overlooking how inextricably our culture is related to nature and by blocking fruitful cultural dialogues that don’t flirt with any cultural appropriation or a sense of colonial superiority. I think I got a little bit carried away here…isn’t this the point when it comes to art though? Exhibitions like Vertigo Sea are popular because they make you think through your instincts, they raise awareness, they shock through beauty, they debate without uttering a single word. The 43-minute film requires multiple watching for the eye to adjust to its brilliance manifested in 3 different points of focus, 2 different time frames and many problematic topics it refers to. A true masterpiece, as far as I’m concerned.